"Group photo of Chinese priests and seminarians in Rome"
Group photo of Chinese priests and seminarians in Rome on the occasion of ordination of three Chinese bishops by Pope Pius XI. 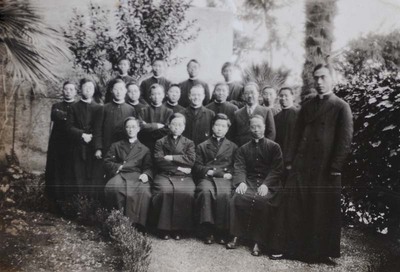 Group photo of Chinese priests and seminarians in Rome. June 1933. Société des Auxiliaires des Missions (SAM) China Photograph Collection, Whitworth University Library, Spokane.